Windward is proud to have been the annual presenting sponsor of October Research’s State of the Industry Special Report since the report’s inception in 2010. Feel free to download your 2014, and all preceding years, copy of the State of the Industry Special Report in PDF format compliments of Windward. How will economic uncertainty shift industry expectations? October Research and presenting partner Windward Consulting | Software have teamed up to produce the 2014 State of the Industry Report, an in-depth report that takes a look at how the economic and regulatory landscape will impact lenders, underwriters, title agents, appraisers, escrow officers, settlement services providers and more. Download the report today, to discover what top economists and industry leaders have to say about 2014, and what you need to do to prepare for the growing market amid the changing regulatory landscape. We hope you enjoy this special free PDF version of the 2014 State of the Industry Report. What is in store for the real estate, title, escrow, and settlement services industry in 2013? We may have a temporary “fix” for the fiscal cliff, but the real estate industry has its own unique set of factors that will determine the 2013 landscape, including improving home prices, shrinking REO inventory, stubbornly persistent unemployment numbers, and the tenuous global economy. October Research and presenting sponsor WINDWARD and ResWareTM have teamed up to produce the 2013 State of the Industry Report, an in-depth report that takes a look at how the economic and regulatory landscape will impact Realtors, lenders, homebuilders, title agents, appraisers, escrow officers and more. Download the report today to discover what top economists and industry leaders have to say about 2013, and what you need to do to prepare for the growing market amidst vast regulatory changes. We hope you enjoy this special free PDF version of the 2013 State of the Industry Report. For 2012, October Research and presenting sponsor WINDWARD and ResWareTM have teamed up to produce the third annual State of the Industry Report, October Research’s most requested special report each year. This 20-page report takes a look at each aspect of the real estate, mortgage and settlement services industry through an aggregation of stories, interviews and data brought together by the October Research staff. We hope you enjoy this special free PDF version of the 2012 State of the Industry Report. 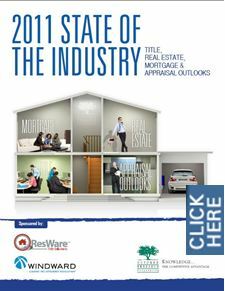 For 2011, October Research and presenting sponsor WINDWARD and ResWareTM have teamed up to produce the second annual State of the Industry Report, October Research’s most requested special report each year. This 20-page report takes a look at each aspect of the real estate, mortgage and settlement services industry through an aggregation of stories, interviews and data brought together by the October Research staff. We hope you enjoy this special free PDF version of the 2011 State of the Industry Report. With the President recently delivering his State of the Union address, isn’t it time to address the state of our Industry? Now, more than ever, we are being pushed towards centralization, transparency, product diversification, automation, greater efficiency and improved customer service. To help you embrace these changes, October Research has compiled the first annual 2010 State of the Industry Report sponsored by WINDWARD and ResWareTM. This 2010 report is 16 pages of in-depth title insurance, RESPA, real estate, mortgage origination, appraisal and regulatory outlooks designed to give you a look at what lies ahead for your business – and the insight to take advantage of it. This groundbreaking report is sponsored by WINDWARD and ResWareTM, and digs deep into title industry consolidation, RESPA implementation, the HVCC’s impact on appraising, the changing regulatory landscape, new legislative and consumer pressures, and recovery prospects for the real estate market as a whole. There’s never been a better time to evaluate the current state of your markets, your workflows, your vendors, your business model and your technologies. We hope you enjoy this special free PDF version of the 2010 State of the Industry Report.